One of the last to leave the factory in Toledo, U.S.A. (on March 1945) this magnificent example of a Willys MB Jeep was sent to fight alongside troops in the last stages of WWII in France, where it was retired thereafter and has spent the last 69 years. This is one of the very best WWII Jeeps that money can buy and always owned by collectors with the ‘everything as would have been’ mentality (which is why indicators were never fitted.) This vehicle has also remained as a 6V, but starts first time, every time. 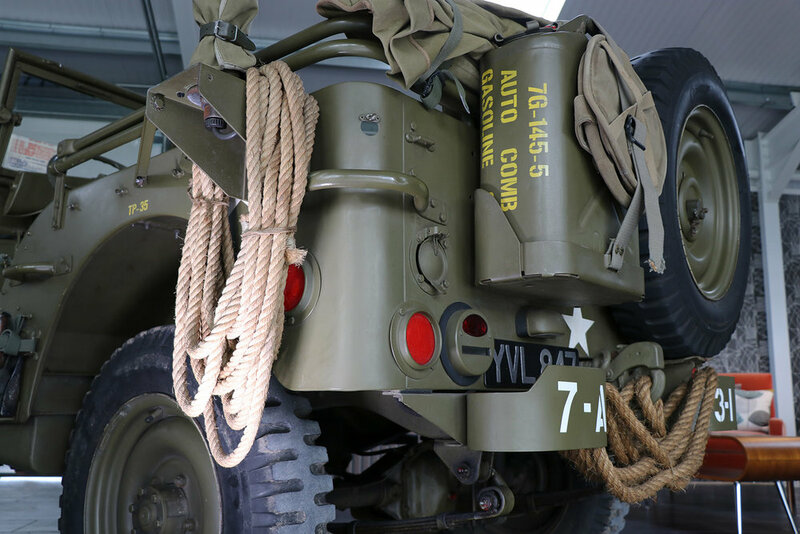 Even the accessories are antiques in themselves; the shovel, axe, jerry cans and water buckets (to name a few) are date stamped and U.S.A. made. The ‘as would have been’ petroleum-based US Olive Drab paint job is in excellent condition and its period green exterior is a real head-turner. The chassis and tub (both original) were lifted, treated and resprayed during the renovation process. Black out lights, extinguisher, manila rope, camouflage netting, tyre pump, M1 rifle holder, mp48 antenna base (worth a small fortune,) desert cooling kit, first aid kit, hand crank, jack and 48 star American flag are all included in the sale. As for the canvas, the Jeep comes with its summer hood, windshield cover, and headlight covers; all made by John and Mary Worthing of CANVASCO; arguably one of the best canvas suppliers for wartime Jeeps around. The canvas winter hood, sides and doors are also present. This is not a ‘trailer queen’ and is regularly driven around (often to shows) but is always stored indoors. The vehicle is, of course, completely rust free. The Jeep was purchased by John Hughes on 16 September 2014 and forms part of a collection of Ferraris, Bentleys, Aston Martins and Jaguars. Sayer-approved, this Willys MB Jeep comes with an extensive history file, including bills and has recently undergone a comprehensive service by a known specialist, including new battery, new fuel pump, new plugs and fluids.